Published on April 10, 2016 in Finance, General T&T, Health, Media, PNM, Politics, Recession and Recession. 16 Comments Tags: Guardian, Politics, T&T Govt, Terrence Deyalsingh. It’s time that nationals grow up and take some responsibility for T&T, says Health Minister Terrence Deyalsingh. Deyalsingh was at the time fielding questions from the media when he attended a health and fitness fair hosted by the Couva Point Lisas Chamber of Commerce, on Saturday, at the Chamber’s building at Camden Road. Published on February 15, 2016 in Carnival, General T&T, Health, International and Politics. Closed Tags: Chickungunya, Dengue, Minister of Health, Raffique Shah, Terrence Deyalsingh, Zika virus. In this space yesterday, Dr Sherene Kalloo launched a broadside against Health Minister Terrence Deyalsingh and his almost jokey war against the Zika virus, pre-empting a column I had already half-written, titled “Man vs Mosquito”. Dr Kalloo argued that Minister Deyalsingh’s declaration of war against Zika and the Aedes Egypti mosquito by deploying soldiers, as hard-hit Brazil has done, as being a failed strategy. It has not worked in Brazil and it will not work here. 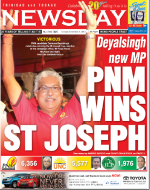 Published on April 5, 2014 in General T&T, Media, People's Partnership, PNM and Politics. 5 Comments Tags: Chandresh Sharma, NP, Politics, Sacha Singh, T&T Govt, Terrence Deyalsingh. Sacha Singh, the ex-girlfriend of former tourism minister Chandresh Sharma, has the contract to clean glass windows at National Petroleum (NP), St Joseph MP Terrence Deyalsingh revealed yesterday. “Who is Sacha Singh? What glass she accustom cleansing?” Deyalsingh asked.